Unique visitors reports in web marketing are a good measure of audience size, ad performance, and the effect of blog mentions or other noise — news reports about you or a competitor, for example — on your site. Per-visitor interest: Unique visitor data can tell you how many people come to your site. On its own, though, it tells you nothing about how much they liked the site. Combine this data with page views and time on the site to make that kind of analysis. Overall site activity: If 100 unique visitors come to your site in a week, that might seem like a small group. However, if they each come to the site 100 times, that’s 10,000 sessions. Use sessions to track site activity, not unique visitors. Audience size: Unique visitors are a great absolute measure of your audience in a given time period. After all, 10,000 sessions are great. If this represents only 100 unique visitors, though, your audience isn’t that big. Overall ad performance: If you just purchased an ad — say, on a blog — and your unique visitor count increases, that could mean the ad’s working for you. You want to dig deeper with page views and referrers, but unique visitor count is a good initial clue. Changes over time: Watch unique visitors over time. If your audience (unique visitor count) suddenly doubles in size after that local news coverage, you know that story had an impact. Comparison with sessions: A single visitor generating ten sessions in a week is still only one unique visitor. By comparing unique visits with sessions, you can see how many folks return to your site more than once. In many businesses, a high ratio of sessions to unique visits is good: It indicates visitor loyalty. See how these metrics build on each other? Sessions alone are useful, as are unique visitors, but sessions compared with unique visitors are even better. Any traffic-reporting package can deliver a Unique Visitors report. However, log file analysis tools (such as older versions of Urchin or WebTrends) require additional setup to report unique visitors. Otherwise, they’ll report sessions only. 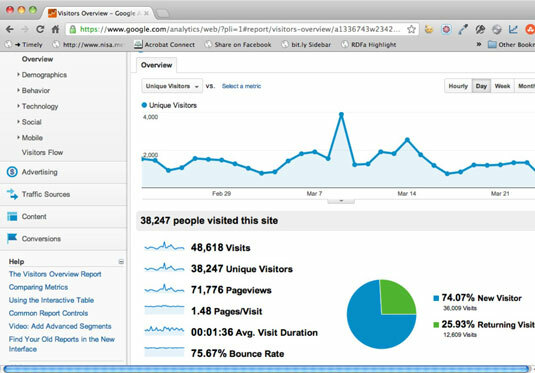 Check your traffic reports to make sure that you’re measuring unique visitors. They’re a must-have metric.